Troy Aikman doesn't know when or if the NFL will resolve the national anthem mess it now finds itself in. He does know Dak Prescott deserves his opinion as much as those protesting during the anthem deserve theirs. In other words, the Hall of Fame quarterback tiptoed through the anthem debate during the opening of his restaurant, Troy's, in Arlington, Texas. "Everyone has their opinion and is certainly entitled to what they feel is best for them - what the flag means to them and what social injustice means to them and how exactly do you protest," Aikman said Friday, via Jori Epstein of the Dallas Morning News. "Dak came out with his opinion and just like all of the others who have had their opinions, I think it's good. I think it's good to share those so maybe we can reach something that makes sense to everyone and get all this figured out." 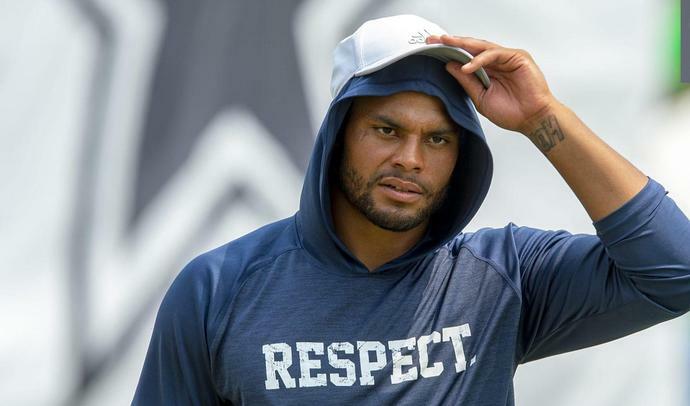 Prescott said it is his belief the anthem at NFL stadiums is neither the time nor the place to protest. The NFL has put its anthem policy on hold as it discusses the issue with the NFLPA. In 14 games so far this week, several players have protested during the anthem, including Marshawn Lynch on Friday night. "As far as how you resolve this anthem issue, people a lot smarter than me have not been able to figure that out," said Aikman, Fox's lead NFL game analyst. "I don't know. I'm not sure we've gotten closer than we got a year ago."